BOTTOM LINE: Sketch comedy that gives tourists a thin slice of the "real" New York. It's like a double-decker bus tour without any of the actual sights. The scripted sketch comedy show, How 2 B A New Yorker, has a new home at the newly remodeled Planet Hollywood in Times Square, a perfect venue for this tourist-aimed night of dinner and comedy. If you're visiting New York and thinking, "Man I really wanted to see a comedy show, but I'm really hungry," then How 2 B A New Yorker is the show for you. Licensed tour guides Margaret Copeland and Kevin James Doyle play over 70 characters as they take you on trip through New York's history and neighborhoods from the early days of Dutch colonization thru the Disneyfication of Times Square. I'm glad that there is a show like this that gives tourists a fun night with good food and some entertainment. It's better than your average comedy show, and a non-New Yorker might find it pretty informative. A major surprise for me was how great the food was. There is a pretty fantastic Italian buffet with salad, chicken parm, fettuccini alfredo, and spaghetti marinara. Throw in some assorted cookies and brownies for dessert and you have a pretty happy audience. 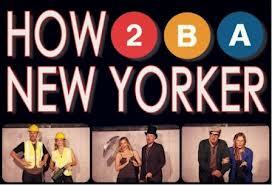 So, if you're not from New York, you're hungry, and you want to laugh a little, check out How 2 B A New Yorker.